It was almost lunch time when I stepped our of Madhura Meenaxi temple. Gathered my back pack and other belongings from cloak room and checked the distance to Thirumalai Nayakkar mahal in Google Map. It said 1km by walk from where I stood but still I confirmed it asking to a traffic police who is standing close to temple main entrance. When I got a final confirmation from Traffic police I started walking towards the road where his fingers pointed and my Google map directed. It was through a small street on either side garments shop. From the display of the price tags I could see, its so cheap but fortunately or unfortunately I am not a die-hard shopper and in super - budget while travelling. So ignored the price tags and kept on moving forward. Finally the alleyways reached on the main road from there I turned to my right and in few minutes I reached in front of Thirumalai Nayak mahal. I could see the crowd in front of the Ticket counter and it was lunch break! My back back was heavy and shoulder was paining. I asked a nearby street food seller whether he can keep my bag till I come back from the palace. But he said he cant't. I cant blame him as it is place numerous tourists coming every day and how he dare to keep a bag from an unknown. After a wait of 30 minutes the counter opened and I got my 20rs tickets to the palace. It was not much crowded so my vision was not blocked by the crowds from seeing the pillars of Mahal which was it famous for. Each pillar got 82 feet height and 19 feet width. You must have seen these pillars in many films, especially in songs of Bombay and Guru films. Rows pillars- it was a beauty to adore but your nose might stink with Bat smell. 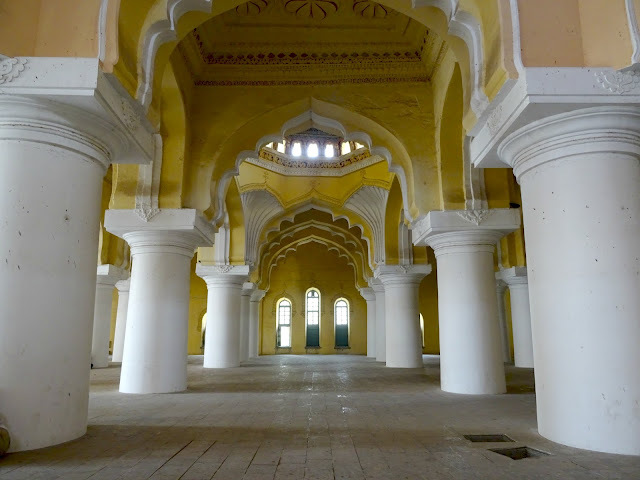 Mahal's architecture is blend of Islamic and Dravidan style. During 16s it was one of the grandest palace in south built by Thirumalai Nayak in 1636. People were keep on coming to palace. Its a visit of hardly 2 hour. If I stay back for evening 6PM, I can see the light and sound show of mahal. But I have to get back to Trivandrum and my train is at 2PM. After few more clicks and I moved out of palace and hailed an auto to the railway station. Train was on time and I reached back my second home town by 11PM in the nigt.